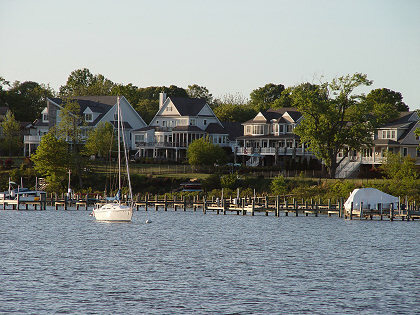 Some of the beautiful (and no doubt expensive) homes along the Rhode River, as seen from Pilgrim anchored off the shoreline. Click on the picture to see a bigger version; use your browser's "back" command to return here. Jerome preparing to steam some corn on the cob for dinner, at our anchorage on the Rhode River. Looking north from where we were anchored at some huge houses on shore. The houses, and even the moored sailboat, can be seen in the Google Maps satellite photo (clickable link provided below). The Rhode River was very peaceful, except when powerboats went zooming by. One of the really funny things I saw (but didn't get a picture of) was a planing sailboat. That's right, a sailboat with a big outboard motor running at full throttle that was up on a plane, just like a planing powerboat. This is very unusual (I've never seen it before), but the sailboat had the type of hull shape that could plane, even though it had a keel like a sailboat. It must require a lot of power. When I make a casual visit to the Rhode River, I usually anchor in the cove along the western shore just above the mouth of the river. Jerome likes very snug anchorages, though, so even though we had very little wind, he wanted to tuck in closer to the shore. We headed farther up the river and anchored close to the eastern shore of the river. I watched Jerome anchor and thought he had a good anchoring procedure (this is one of the advantages of crewing for other skippers—you get to observe their techniques and learn from them). 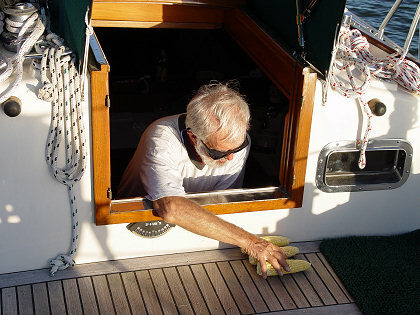 He has an electric windlass with power up/down that can be operated from the foredeck, but it can also be operated remotely from the helm by using a switch on the cockpit coaming. This is useful if you're single-handing, so you can raise or lower the anchor from the helm. Before lowering the anchor, he motors in reverse to stop the boat and even get it moving slightly astern. Then he lowers the anchor from the helm, keeping the transmission in reverse but the throttle at idle. This keeps the chain stretched out as he lets out more chain and encourages the anchor to set. There's little risk of the anchor skipping along the bottom because the engine/propeller is not very powerful at idle (boats with more powerful engines might not be able to keep the transmission in gear). Once the proper amount of chain is deployed, he uses high power (in reverse) to dig-in the anchor, while watching the chain to make sure it stays bar tight (indicating a good, solid, set). Finally, he comes to the foredeck and installs a snubber, which is a length of stretchy nylon line with a chain hook to grab the chain. The other end of the snubber goes to a foredeck cleat, so the anchoring forces are transferred to a sturdy cleat and not to the windlass. The final step is to let out more chain so the snubber takes up the load. Jerome has one concern about his main ground tackle: the chain is only 5/16" instead of 3/8". The smaller chain is lighter and so puts less weight on the bottom to help hold the anchor in-place. In ordinary weather this is of no real consequence, but it could matter during a blow. After anchoring and shutting down the engine, the peace and quiet was exceedingly pleasant, and we enjoyed a serene early evening. Jerome started preparing supper, which consisted of steamed corn on the cob, soup, and salad, all from Whole Foods Market. Jerome is a good cook, and in fact did all the cooking during the cruise. Unfortunately, I discovered that I forgot to bring a bag of groceries that I had put aside on my boat. I remembered to bring the refrigerated items, but I forgot to bring the non-refrigerated items. Oh well, they'll be there waiting for our next cruise. After dinner, I unpacked some items and got settled into the aft berth, which will be my quarters during the cruise (Jerome is using the V-berth in the forward cabin). I noted again the spaciousness of the Tayana 42, with oodles of storage everywhere you look. 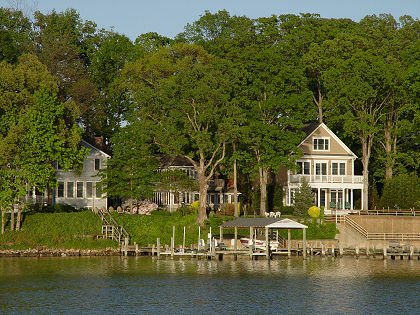 The story continues on the next page, where we do more boat work and get to visit Galesville. Looking across the Rhode River at the peaceful early evening scenery. 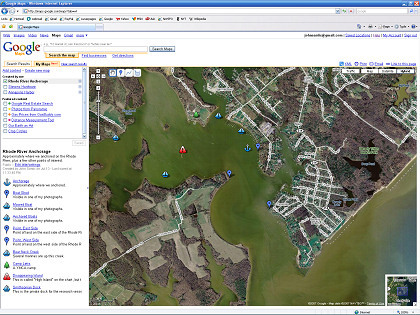 Click on the picture to launch Google Maps and display an annotated map of the Rhode River, showing where we anchored and some nearby points of interest. Use your browser's "back" command to return here. Click on the picture to display a chart for the Rhode River. (97 kb) Use your browser's "back" command to return here. How to use planer boards while fishing - I see people using planer boards a lot; this explains how to use them.